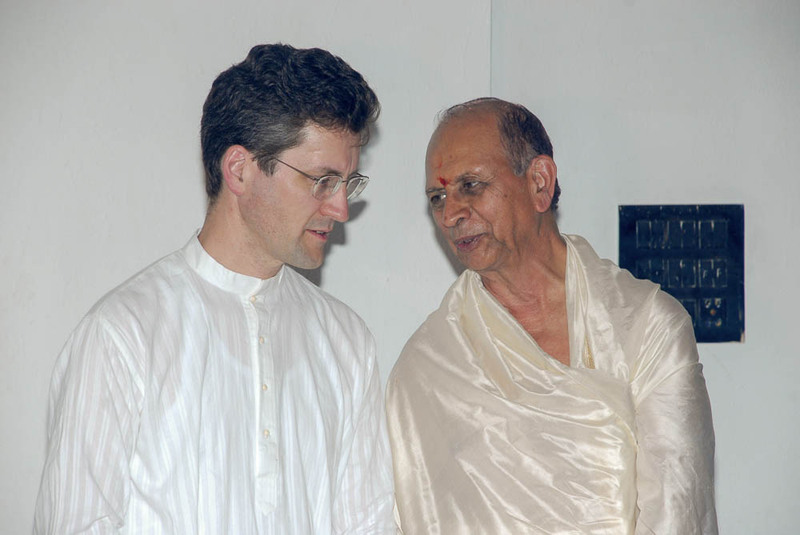 When Rima invited me to attend her father’s 75th birthday celebration, at a temple in southern Bangalore, I was more than happy to accept. A 75th birthday is a special event for anyone, anywhere, and I was honored to be asked to share such an event. Even more honored to be invited to a family event, in a culture where family is so important — and families are so welcoming. So I put on my finest kurta and pyjamas, and set out to find an auto driver who could understand where I wanted to go. 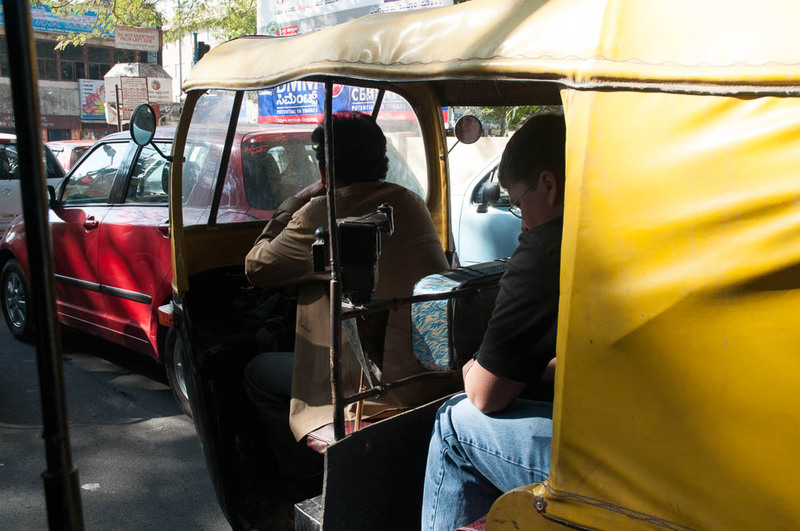 (I’ve written about autos, and auto drivers, before – and this day was pretty typical. They quote overly high prices, I get out of the auto and walk a few blocks ’til I find another auto; this is the routine.) Finally I found a willing driver, but we had to duck into a nearby shop so the shopkeeper could read the address and help the driver figure out where it was. After a bit more price negotiation, we headed south. Ceremonies were finished, the floor was swept clean, and lunch prepared. The staff laid out about a hundred banana leaves, in rows, on the marble floor. Each guest chose a place to sit. Next to each leaf was placed a metal cup with water. 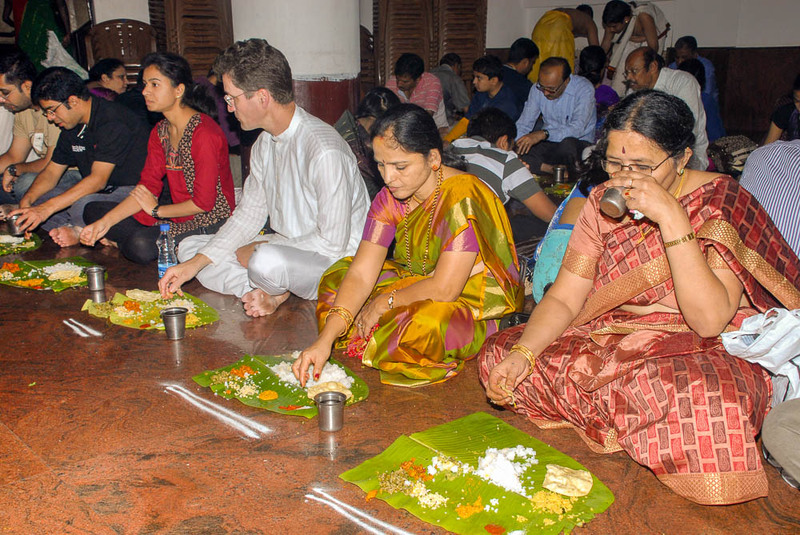 Then the staff came along with buckets of food, rapidly scooping out chutneys, curries, dals, rice, curd, sweets, and more, using their hand (or sometimes a spoon). Sitting on a marble floor eating food served by hand from a bucket onto a leaf — this is not everyone’s idea of fine dining — but the food was wonderful and plentiful and the mood festive. I marveled at how quickly the food was served to so many – really, it took them about 3 seconds per person as they came by with each dish. I ate so much it was hard to stand up! As we all prepared to leave, a group of cleaning women came along stacking the leaves and their leftovers; it occurred to me that, other than the reusable metal cups, everything left was compostable. I really enjoyed my time at the celebration. Many of Rima’s cousins introduced themselves and were very kind in welcoming me to the event. Thank you all for inviting me, for allowing me to join your family for the day. And thanks for the two photos of me, above. I posted a dozen more photos. My very best wishes to Rima’s father on his 75th birthday! 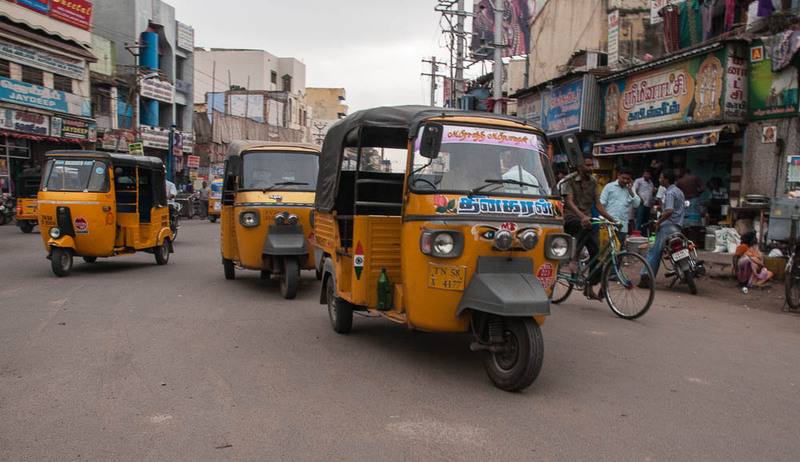 Crossing the street in Madurai, in light traffic. Having spent time in Mumbai and Madurai on this trip, I can again state that Bangalore has the worst traffic. Still, it somehow seems better than last year, at least in the places I’ve been. Bangalore is building a new metro rail system, and the first segment opened this year. I saw the trains gliding above M.G. Road last week. This line only serves a particular area, however, so it will take time before the metro system has a broad impact. People tell me that the Delhi metro has made a big difference since it was fully open a few years ago. New flyovers are there, as well as subways. A “flyover” is a bridge or elevated roadway; a “subway” is a tunnel. They are both used to ease congestion at an intersection by avoiding the need for stoplights or avoiding cross-traffic. As a pedestrian, I’ve seen some new “skywalks”, that is, pedestrian bridges over particularly busy streets or intersections. Still, in most places, to cross the street is means weaving through moving traffic and hope that the traffic goes around you instead of over you. But the biggest novelty is the advent of pedestrian crossing signs — those green and red lights that tell you when it’s time to walk. They seem to work whenever there is a traffic cop present – all the traffic stops and the pedestrians can safely cross. But at other times, I’ve noticed that the traffic ignores the walk sign and just proceeds into the intersection! After three weeks walking the sidewalks of India I notice myself becoming more aggressive. I push my way through crowds, I bat away the touts who want to sell me trinkets, I step out into traffic as if I own the street. That’s just the way it’s done. Maybe it’s a city thing. Maybe it’s an India thing. But if I defer to either courtesy or safety, I’d never get across the street. Every time I arrive in Bangalore it feels like coming home. 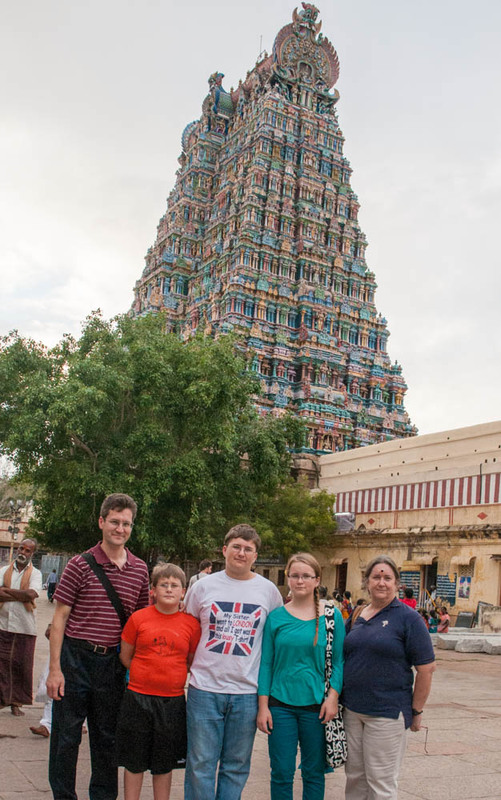 Even the kids – who were last here three and a half years ago – said it feels “welcoming” and “comfortable” here, particularly at IISc where we lived. We arrived on December 29; Pam and the kids get four days here before making the long trip home. I’ve posted some photos. So far we’ve spent time with friends and families of friends. On Sunday we had a wonderful lunch at MTR with Bhavna’s parents, on Monday we had breakfast with Rima and her parents, and afternoon tea with neighbors at IISc. Today (New Year’s Day) we’re resting and plan a bit of shopping. Lunch at MTR is always an incredible experience. I first ate there in April 2009 and have returned several times. That location, the original, is an old building and you practically walk through the kitchen to get to your table – a bustling kitchen with vats of bubbling curry and sambar. On Sunday we visited a newer MTR location on the top floor of a new hotel building in Jayanagar. We had to wait 45 minutes for a table, because so many families were out for a Sunday meal. The anticipation only makes it tastier! They filled a roomful of tables all at about the same time; this is how they are so efficient. Everyone sits at the same time. Then they lay out the plates. Then a flurry of waiters come around, each carrying a bucket of something — chutney, curry, salad, etc – stopping at each table to slop some onto each plate. If you want more of anything, you just wave down the waiter when he comes around with more. I made the same mistake I’ve made before, that is, to ask for more dosa only to realize that there are several more courses to come. Mara and I counted 20 separate foods they delivered. We were so full, but the food is so wonderfully tasty. Our first visit to IISc was a real treat for the kids. We went to their favorite candy shop, and we walked through our old neighborhood and along the same route to the school bus stop. This brings back so many memories! one would say “remember when we saw…” or “remember the time when we did…” and they would all laugh about it. We tried to visit our apartment but it is occupied by new residents who did not seem to understand why we were visiting. We did have a nice tea with our downstairs neighbor, talking politics and listening to her visiting daughter tell about her experience living in NYC through Hurricane Sandy. We spent New Years Eve at one of our favorite restaurants (The Tandoor) on M.G. 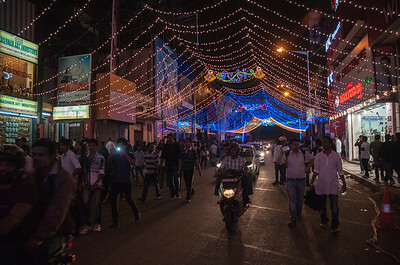 Road, and walked back via Brigade Road, which was festooned with colorful lights for the holidays. Hundreds of people were gathering in this popular street, and 16,000 police were patrolling the area [The Hindu]. Back at our hotel, a dance party had thumping loud music until after midnight, and the kids stayed up late watching movies. Do check out the photos. Now we’re off to do some more exploring. More later!